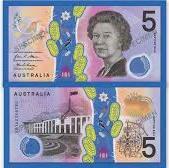 The Reserve Bank of Australia has revealed a new $5 note to be introduced from 1st September 2016. With innovative new security features, the note has a colourful design of the Prickly Moses wattle and the Eastern Spinebill. The new notes will also feature a new “tactile” feature to help the vision-impaired community distinguish between denominations.